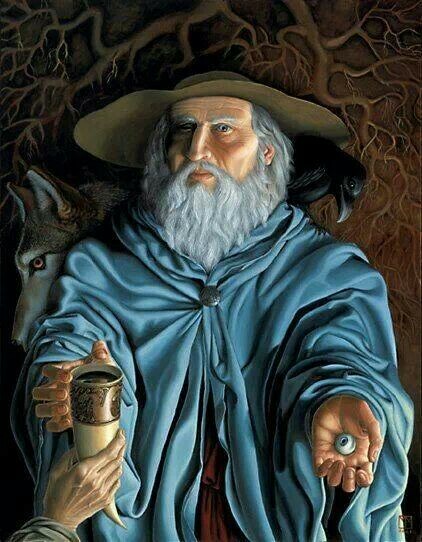 Let us return to the story of Mímir’s Well, and Odin’s sacrifice of an eye. What does this loss signify? As Wagner recognized, it means that while Odin gains wisdom, he also becomes half blind. On a literal level, this is obvious. But what is it that he becomes blind to, and what is it he is able now to “see,” once he drinks from Mímir’s Well? Very simply, the drink opens Odin’s eye to eternal truths – hidden truths – that are not available through ordinary, sensory experience. Of course, it is in fact his mind’s eye that is opened to these truths. The “vision” that the drink gives him turns him inward, toward the things that can only be known by the mind. But the loss of one of his literal eyes signifies that in the process he loses half of his outward vision: his vision of the world at his own feet, so to speak. His consciousness is now divided between an enthralling world of eternal verities – with which Odin, the seeker of wisdom, desires to thoroughly involve himself – and the “external” world of finite particulars, which he now perceives with about half the acuity that he had before he took his famous sip from the well. Now, what does this story have to teach us? The turn “inward,” the opening of the eyes of the mind to the realm of truths that only the mind can know, is the source of much that is great. It is the source of scientific and philosophical speculation. But it is bought at the price of the partial disconnection from the world. The lover of wisdom is always in danger of failing to see much that is plainly in front of him. There is always the danger, for example, that he may be misled by theories or ideals that are divorced from reality. For example, instead of acting as the steward of nature, he may be seized by delusions masquerading as grand ideals, which lead him to pervert or violate nature. (This lesson is absolutely crucial to Wagner’s interpretation of Wotan/Odin. ) He may become bewitched by implausible theories about the perfectibility of man, and set about trying to radically change human nature, and society. Now we begin to see that what the figure of Odin really represents is not so much man per se but Western man, more specifically Northern European man – with all his great virtues, and his great faults. This is who we are, like it or not. Oswald Spengler’s understanding of Northern European man as “Faustian” (which I have discussed in a number of other essays) is quite useful here – both for illuminating the nature of Odin, and our own nature (which comes to the same thing). Further, he states that “the Faustian is an existence which is led with a deep consciousness and introspection of the ego, and a resolutely personal culture evidenced in memoirs, reflections, retrospects and prospects and conscience.”  What characterizes the Faustian soul, then, is a kind of duality. On the one hand it is given to solemn inwardness; to looking within, and finding the answers within our own individual conscience (Odin’s “inward vision”). But this goes together with an outward-striving will that, in multiple forms, yearns for the infinite. In sum, Spengler holds that European man is animated by the will not just to master all of nature, but to transcend the limits of the physical world itself. What is Valhalla? . . . [It] is something beyond all sensible actualities floating in remote, dim, Faustian regions. Olympus rests on the homely Greek soil, the Paradise of the Fathers is a magic garden somewhere in the universe, but Valhalla is nowhere. Lost in the limitless, it appears with its inharmonious gods and heroes the supreme symbol of solitude. Siegfried, Parzeval, Tristan, Hamlet, Faust are the loneliest heroes in all the cultures. Read the wondrous awakening of the inner life in Wolfram’s Parzeval. The longing for the woods, the mysterious compassion, the ineffable sense of forsakenness – it is all Faustian and only Faustian. Every one of us knows it. The motive returns with all its profundity in the Easter scene of [Goethe’s] Faust I. It is rather obvious, in fact, that the Faustian is equivalent to the Odinic. Wagner clearly saw this, and modeled the Wotan-Loge relationship in Das Rheingold on the relationship of Faust to Mephistopheles. To the examples Spengler gives concerning architecture, music, and painting must surely be added the intellectual tradition of Northern Europe: philosophy, science, theology, and mysticism. Here we truly see the Odinic, in our insatiable desire to bring everything into our ken; to find ourselves in everything. Thorsson writes: “By his very nature Ódhinn synthesizes everything around him. He makes all things his own and uses them according to his will, while remaining in an essential way apart from outside things.”  The entire Northern European intellectual tradition is Faustian, or Odinic. And we should speak specifically of “Northern European.” Because although there is a European character that we can see in both the Greeks, for example, and the Germans, there are significant differences. These differences are very revealing, and I will offer a brief sketch of some of them. For the Greek thinkers the soul is potentially all; whereas the Germanic tendency is to think that it is actually all. Contrast Aristotle with Leibniz (or Hegel). For Aristotle the mind has the potential to become one with its object by taking on the object’s intelligible form. Further, the mind has the potential (never fully actualized) to take on the intelligible forms of all things – the potential, in other words, to contain the entire universe. But Aristotle tells us in De Anima that it has this ability in virtue of having no form itself; in virtue of being nothing. Leibniz’s philosophy of mind is essentially the complete inversion of Aristotle’s. Mind does not potentially contain the entire universe, it actually does. Mind is not open to a world “out there,” for the world is already “in here.” Minds (monads) are “windowless,” Leibniz declares: we do not peer from our interior at a boundless “out there.” Instead, it is our interiority that is boundless. And mind is not “nothing”; in fact, it is everything. Leibniz’s position is Odinic or Faustian: we find truth in the all, but we find the all in ourselves. Further, the Greek tendency, which we find in Orphism, Pythagoreanism, Parmenides, Plato, and Hellenistic Gnosticism, is to devalue nature and the body; to declare that they are unreal, or at least an impediment to the attainment of wisdom. The Germanic tendency has been more “this-worldly” – seeking truth in the body and in the world around us. This is evident, of course, in the spirit of the mythic sources, and in the idealism of Schelling and Hegel, which is the highpoint in the development of the Germanic speculative impulse. For Schelling and Hegel, we find ourselves in nature. In knowing the world around us, we know ourselves. The “speculative impulse” is just the Odinic spirit: seeking itself in all things, and all things in itself. What we have in Hegel’s philosophy is simply the self-understanding of European man. But that self-understanding is already there centuries earlier, in mythic form, in the figure of Odin. It is important to note, however, that the self-assessment of European man encoded in our myths is far more nuanced and pessimistic than Hegel’s account, which was influenced by Enlightenment ideals. The figure of Odin is deeply ambivalent. On the one hand he is a heroic figure, bravely seeking wisdom and power. On the other hand, however, he is clearly a tragic figure. I have already noted the significance of his partial blindness. And his lust for power, and intervention in the lives of others, often has destructive consequences. Again, of all the bards who have retold and amplified the legends of Odin, it is Wagner who most clearly and powerfully brings out the tragic nature of the god. And since Odin represents us, I have already noted the sobering conclusions we must draw, when we reflect upon his character. What more have we now learned about the path of the Odinist? We have learned, first of all, that it is a Western path. In following it, we Westerners are realizing in the flesh what Jung referred to as the “Wotan archetype,” which is planted deep in the European – especially, of course, Northern European – soul. In following the Odinic archetype, furthermore, we Westerners really do make a kind of Faustian bargain. In our ceaseless pursuit of knowledge and power – in stretching ourselves out towards the infinite – we risk losing much more than an eye. We risk losing our souls. Is there hope for the Odinic-Faustian West? This is the most important question of the present age – the most important question for us. But there is a deeper philosophical question that lies behind this one: is the Odinic spirit necessarily tragic? Does it doom us? To this question the Odinic answer can only be: we will not accept this. This is certainly the only answer I can give, for the Odinic is spirit my own – it is my ancestral spirit. It is impressed upon my soul, and cannot be effaced. I cannot, therefore, shake the conviction that only the Odinic spirit is capable of solving the problems that it has created. Only the pursuit of more knowledge – no, of wisdom – can give us the power to correct our course. Is this merely the archetypal Odinic blindness speaking? Perhaps. Or perhaps it is Odinic wisdom speaking. Thorsson gives a “positive” interpretation to the loss of the eye, whereas my interpretation (and Wagner’s) is more “negative.” Thorsson writes: “Ódhinn ‘hides’ his eye down in the column of vertical consciousness, down in the depths. There his eye remains active, always able to see, to ‘drink in,’ the wisdom of all the worlds. Thus, Ódhinn always has two visions – one over ‘this world’ (from Hlidhskjálf) and one in the ‘other worlds’ (from the Well of Mímir).” Runelore, 192. See my essay “Wagner’s Place in the Germanic Tradition.” I argue that Wagner should be viewed as a major interpreter and continuer of the Germanic mythological tradition, and that Der Ring des Nibelungen should take its place alongside such texts as the Nibelungenlied and Völsungasaga as a canonical source for Odinists and Ásatrúar. Quoted in Ricardo Duchesne, The Uniqueness of Western Civilization (Leiden and Boston: Brill, 2011), 335. See my essay “Wagner’s Place in the Germanic Tradition.” See also Deryck Cooke, I Saw the World End: A Study of Wagner’s Ring (Oxford: Oxford University Press, 1991), 131. Hegel’s Philosophy of Mind, trans. William Wallace and A. V. Miller (Oxford: Clarendon, 1971), 45. Hegel’s Philosophy of Mind, 45. C. G. Jung writes that “the god of the Germans is Wotan and not the Christian God.” Wotan, Jung says, is “a fundamental attribute of the German people” and “a Germanic datum of first importance, the truest expression and unsurpassed personification of a fundamental quality that is particularly characteristic of the Germans.” Although a good deal of Jung’s essay – written in 1936 – deals with modern Germany, we must understand him in these passages to be speaking broadly of the Germanic peoples. See C. G. Jung, “Wotan” in Civilization in Transition, The Collected Works of C. G. Jung, Vol. 10, trans. Gerhard Adler and R. F. C. Hull (Princeton: Princeton University Press, 1970), 191, 186. See Duchesne, The Uniqueness of Western Civilization, 336. See Spengler, Man and Technics: A Contribution to a Philosophy of Life, trans. Charles Francis Atkinson (London: European Books Society, 1992). See the final section of my review of Duchesne’s The Uniqueness of Western Civilization in North American New Right, vol. 2, ed. Greg Johnson (San Francisco: Counter-Currents, forthcoming in 2014). I know self-proclaimed Odinists/Odians and Ásatrúar who take what amounts to an anti-intellectual position, insisting that the root of modern ills is precisely our ceaseless quest for knowledge and power. Apparently, they think that we can simply “stop” – that we can change our nature, and dam up the “infinite thirst for knowledge” that Hegel held to be our chief feature as a people. This is not only highly unrealistic, it is contrary to the spirit of Odinism and Ásatrú. And those who profess such beliefs lack self-knowledge. We are all Odinists, for better or worse. We cannot get that eye back, try as we might, or pretend that we never hung on Yggdrasill.